At the meeting of the World economics and world politics club in Moscow last week, some of the leading Russian experts on Afghanistan and the Central Asia have discussed the situation in Afghanistan and implications for the Central Asia following the scheduled withdrawal of the NATO troops from Afghanistan after 2014. Key note speakers included Zamir Kabulov, the Russian President’s special representative for Afghanistan and Nikolay Borduzha, the secretary general of the CSTO (Collective Security Treaty Organization). The meeting has been moderated by Fedor Lukyanov, the editor-in-chief of the “Russia in global politics” magazine. As most discussions under the auspices of the World politics and world economics clubs follow the famous Chatham House rule (participants are free to use the information received, but neither the identity nor the affiliation of the speaker(s), nor that of any other participant, may be revealed), we provide a brief description of the main ideas expressed by participants. Perhaps the main paradox identified by the experts regarding the military presence of the United States and NTAO in Afghanistan reads as follows: “America has lost this war but has no intentions to leave”. Most speakers agree that the US is not in a position to leave Afghanistan despite Obama’s statements. It is also clear that it has got no good idea of what it should do in Afghanistan, accounted for by absence of coordination among different stakeholders. Only few disagree that Taliban is going to regain its power in Afghanistan. Taliban already gains an upper hand in the “information” war: local population does not see the American soldiers as liberators. Under ongoing Western-backed program more than 350,000 Afghan army and policemen are supposed to be ready to take over control by 2014 but it will require around 8 billion dollar a year to secure their regular salary. 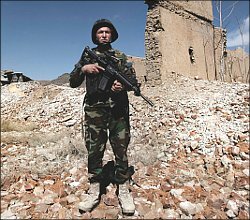 Inevitable drop in aid, according to Afghan experts, may cut down the Afghan security forces to as low as 70,000 within a few months of withdrawal but the nightmare is that many trained security men will have no option than to join private militia, warlords or even Taliban ranks once they do not receive the promised “good salaries”. Obviously even Americans admit that Taliban might get back its power, and pressure to remain in Afghanistan pushes them to engage in negotiations with the Taliban. The situation in the Central Asia today is conducive for emergence of extremist Islamic organizations, numbers of the radical Islam adepts grow (by some estimates, in Kyrgyzstan alone, around 50-70% of the population follow non-traditional Islam). Meanwhile, it is the Moscow’s belief that the Central Asian states underestimate the gravity of threats that Afghanistan might present. Russia insists on building some powerful security infrastructure within the region of Central Asia, equal or at least comparable to that of the United States and NATO, while the Moscow’s partners within the CSTO are obsessed with mutual pretensions and appear unable of making collective efforts towards creation of such a line of defense. One of the main conclusions made in the course of the club’s discussion is that “if we want stability in the region we need a higher level of solidarity and mutual support in lieu of mutual pretensions. So far the CSTO members put their own national interests far above the regional ones”. Disputes among the CSTO member states remain unresolved even in the face of a major common threat. The United States in particular and NATO in general are not interested in pursuing any further cooperation with the CSTO due to such inbuilt problems of the organization, in an understanding that dealing with the CSTO is just a waste of time. The only effective strategy for the United States is to develop bilateral relations with each of the individual state in the Central Asia, while Moscow tries to counterbalance the growing American influence over the region.